There are different shapes, models and classifications of probability distributions including the ones discussed in the probability distributions article. It is always a good practice to know the distribution of your data before proceeding with your analysis. Once you find the appropriate model, you can then perform your statistical analysis in the right manner. 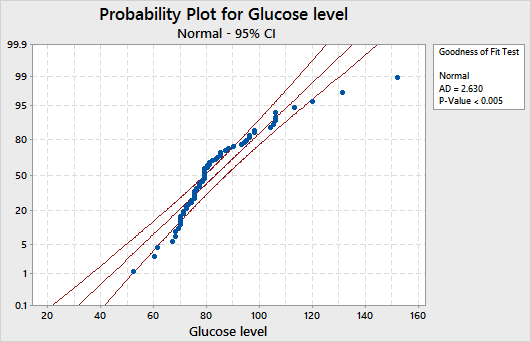 Minitab can be used to find the appropriate probability distribution of your data. You may use the Individual Distribution Identification in Minitab to confirm that a particular distribution best fits your current data. It allows to easily compare how well your data fit various different distributions. Let’s look at an example where a hospital is seeking to detect the presence of high glucose levels in patients at admission. For this example, you may use the glucose_level_fasting worksheet. Remember to copy the data from the Excel worksheet and paste it into the Minitab worksheet. A given distribution is a good fit if the data points approximately follow a straight line and the p-value is greater than 0.05. In our case, the data does not appear to follow a normal distribution as the points are not close to a straight line. You may transform your non-normal data using the Box-Cox or Johnson transformation methods so that it follows a normal distribution. You can then use the transformed data with any analysis that assumes the data follow a normal distribution. 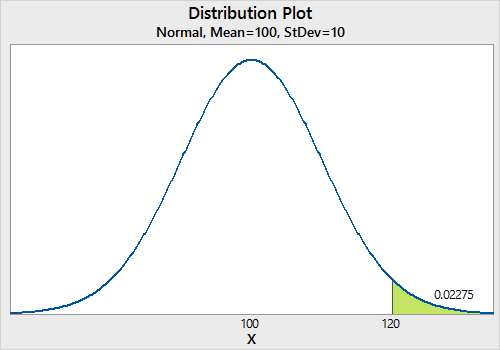 View Single to display a single probability distribution plot. Vary Parameters to see how changing parameters will affect the distribution. Two Distributions to compare the shape of distribution curves based on different parameters. 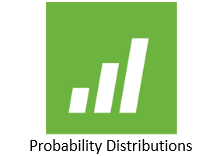 View Probability to see where target values fall in a distribution.